Acquired TastesIn Acquired Tastes, The Takeout explores the food and drinks we can’t live without. As the story spread over the Internet, I’m sure durian lovers were dismayed to see most articles painting durian in such a negative light, namely, for its notorious stench and that in several Southeast Asian countries it’s banned from public transit and hotels. But hardly any of these writers talk about the rich sweetness of durian flesh, which can have a creamy texture similar to high-quality custard or perhaps a slightly firm chocolate ganache. Durian doesn’t really have an equivalent in flavor (even though people have likened the flavor to almond or vanilla). 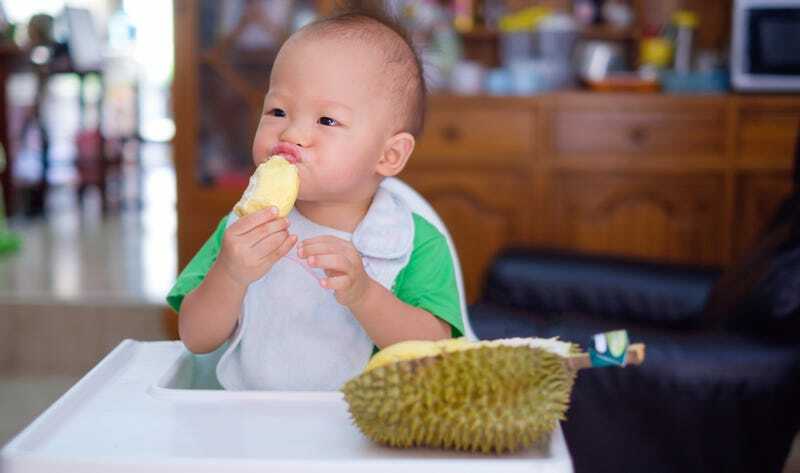 Perhaps durian’s taste can only be captured through metaphor: it’s what would happen if a toddler invented a fruit made up of everything they like—from dinosaurs and farts to ice cream and pudding. Durian is native to Southeast Asia, and there are several varieties (around 100 in Malaysia, over 300 in Thailand) ranging in texture, flavor, size, and price. Kanyao durians from the Nonthaburi province in Thailand are often sold for up to $600 U.S. each, and the most expensive kanyao was auctioned off at more than $9,000 in 2017. They’re also difficult to find in stores, and more often than not, you’ll need high-powered connections to get access to the durian farms that grow them. In Malaysia, the Musang King or Raja Kunyit (known as Mao San Wong or “Cat Mountain King” in Cantonese) is the most-prized durian, which means that it often commands around $13 per kilogram—but, as with the Kanyao, good luck finding an authentic one as they’re quickly snapped up, and a number of knockoff versions are sold on the markets. However, 2017 saw the first Malaysia International Durian Cultural Tourism festival—where about 2.5 tons of durian were sold by the end of the first day—which bodes well for Musang King hunters. Thailand has long been the largest exporter of durian, so many of us who don’t live in durian-growing areas have probably eaten at least one of the many Thai varieties. Most prefer the elongated Monthong durian, which produces aromatic kidney-shaped pods of flesh. Many durian eaters have probably encountered at least one watery or stringy and flavorless durian. The key really is to find a reputable durian seller but barring that, there are a few ways you can tell whether a durian is ready to eat. Ripe durians have a distinctly pungent aroma, but not overwhelmingly so. The best place to take a whiff is at the root of the stem and the seams between the spikes. Stems should look relatively fresh and green; withered stems indicate that durians have been off the tree for a while. And finally, there’s the “thunk” test. With the flat of a knife, give the durian a good thwack. There should be a distinct “thunk” sound that shows the durian flesh has ripened enough to shrink from the skin. However, if it sounds too hollow, the durian may have dried out. For people living outside Southeast Asia, it may be easier to find a frozen or pre-packaged durian. Be prepared for a rather underwhelming experience, although timid people might find this this a good way to try the fruit for the first time. Otherwise, there is a plethora of durian desserts and snacks if the thought of bringing home an entire durian doesn’t appeal. For sweets and pastries incorporating fresh durian, I would say durian pancake—a scoop of durian and a dollop of cream wrapped up in a fragile crepe—never fails to please, and if you can’t find a place that sells them, this is a pretty good recipe. Other crowd-pleasers are durian ice cream and durian mochi (although good durian mochi might be too much durian for beginners). For snacks, there’s crispy freeze-dried durian chips; read the packaging carefully to make sure that the durian hasn’t been fried in oil, which tends to remove its unique flavor and smell. The Musang King durians lend themselves particularly well to being freeze-dried. Malaysians also have durian-flavored dodol, a chewy sweet made with jaggery and rice flour and usually comes packaged like sausage meat. The Indonesians have something similar called lempok durian, which omits the flour, leading to a less toffee-like texture. Either one should be available in an Asian grocery with a decent selection of Southeast Asian snacks. There are a few Southeast Asian urban legends surrounding durian, the most common being that eating durian and drinking alcohol will kill you. While death is more likely to happen to people encountering your potent post-durian and alcohol breath (or if one unfortunately falls from a tree and hits you), studies show that durian’s high sulfur content prevents an enzyme in your body from metabolizing alcohol properly. So durian and alcohol probably won’t kill you but it will definitely make you feel worse afterwards—unless you’re drinking durian wine, since the fermentation process reduces most of the sulfur in durian, making it a safer and less smelly way of enjoying both alcohol and the fruit. It always comes back to the smell, and in an attempt to reach a larger audience, odorless durians have been introduced to the market. But what would be the point? An odorless durian is a poor replacement that lacks what makes durian so delectable. Perhaps it’s true that durian lovers are benign masochists who enjoy the disgusting but edible “safe threat” that durians pose with their smell, but I like to think that we are people whose embrace of the gross realities of life is rewarded with the pleasures of one of nature’s most delectable fruits.